Review: The clan megablaster for the Gold Paladins is Knight of Fury, Agravain. Unlike many of the previous cards in this series of skill, Agravain does not need his attack to connect for his skill to activate. At a soulblast 8 and counterblast 5, Agravain gains +1000 power for each of your Gold Paladin rearguards, and +1 critical--as an additional bonus, the power and critical gain is a continuous effect that lasts for the rest of the game. 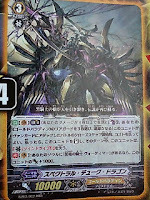 Maxing out at +5000 power, this effect continues even on the opponent's turn, turning Agravain into a powerful wall. While the gain may appear tempting, this skill is far too cumbersome to justify its use, as this brand of paladin does not have a strong soul engine and they are already heavily counterblast and soul-reliant. 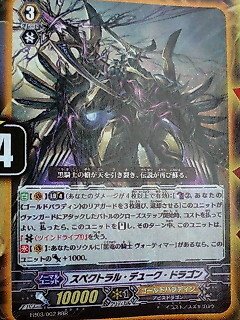 Agravain's power will also fluctuate based on your opponent's ability to retire your rearguards. Most of the other images gain +5000 power via a less costly skill, albeit not during the opponent's turn. Agravain has no limit break skill, and absolutely no use in the rearguard. His build is, unlike the below cards, too inconsistent to see pure Gold Paladin play, although he may have some potential in a Gold-Royal mixed deck. I would recommend Lucan before I would him. Second is a face that any veteran Royal fighter will be familiar with; Knight of Endurance, Lucan. 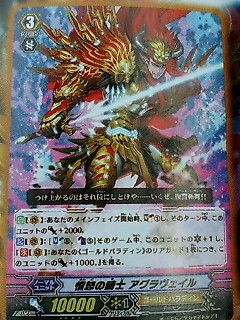 Lacking a limit break, Lucan gains +5000 power when he drive checks a grade 3 Gold Paladin unit. This skill once again lends itself to a particular build that members of the old guard have been long relying on, and the Gold Paladins have certainly started off this tournament season with a vastly higher count of grade 3s to support it, but their superior ride abilities are not quite ready for such a lopsided deck. I would recommend Lucan as a substitute until Satellite-Fall, Battlefield Storm or any of the units described below can be obtained. The Burning Lion, Blonde Eisele is the centerpiece the new paladins are craving. There are three factors driving this; first, Eisele is the sole target of the Crimson Little Lion, Kilif's superior ride skill, allowing access to grade 3 one turn early. As this skill requires Gareth to be in the rearguard and Beaumains as the vanguard, and thus balances itself with Eisele's twin drive, it can nonetheless easily overwhelm a lower-graded opponent. Second and third are Eisele's skills. When at 4 or greater damage, Eisele's limit break kicks in--by counterblasting 2, he can check the top card of the deck, and if it's a Gold Paladin, it can then be called to an empty rearguard circle. As this is an activate skill, Eisele can use it repeatedly to fill the field, and it combines with both its secondary effect of giving him power equal to that of the unit called, and with his continuous skill, gaining +1000 power during your turn for each Gold Paladin in the rearguard. This turns Eisele into a small but highly efficient Alfred, with less steep of a cost associated in exchange for less precision. The superior ride and his ability to rapidly gain field advantage, which itself combos nicely with on-call and on-boost skills like those of Silver Fang Witch, Blessing Owl and Waving Owl, makes Blonde Eisele easily the best of the initially introduced images available for Gold Paladin. If the Witch is called it's like getting an extra draw trigger in, if Blessing Owl is called it makes Eisele an immediate +9000, and if Waving is called it can be bounced into the hand to aid with guarding. No matter what unit comes out by this skill though, it will give Eisele a bare minimum of +5000 power for that turn. 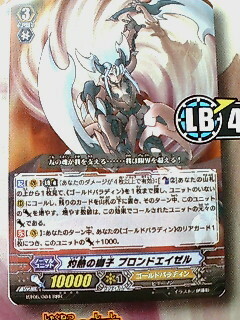 Accompanying Eisele is the Great Silver Wolf, Garmore. He's gained some tricks since retiring his Fang of Light title--at limit break 4, Garmore will gain +5000 power when attacking a vanguard. 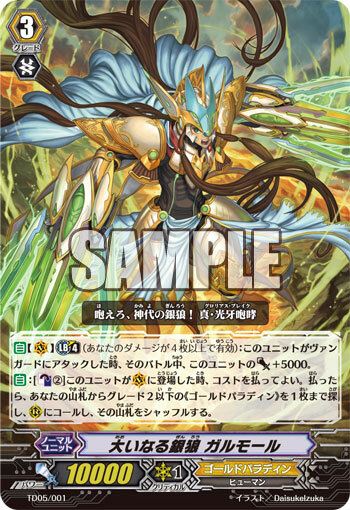 And when entered into the vanguard circle, Garmore can counterblast 2 to superior call one grade 2 or lower Gold Paladin, including the famous Witch or his own custom support unit, Charjgal. Garmore's weakness is shared with Eisele, in having no particular skills that lend to his use in the rearguard, but for Garmore this is offset by Charjgal. Since Charjgal is not especially particular about where Garmore is, as long as you have the soul to fuel the high dog's soulblast, you have a 20000-power attacker. Overall, I would recommend Eisele over Garmore due to the sheer utility of his skills and highly convenient superior ride, but that superior ride itself means that you only need two or so copies of Eisele. 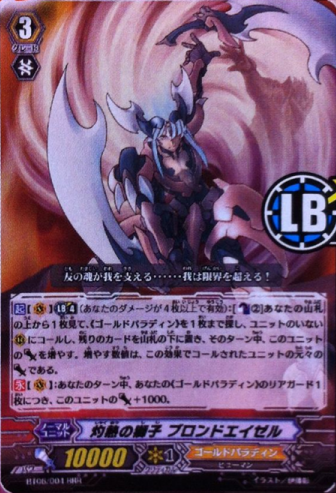 As such, Garmore comes in as a good backup and even better followup unit, and he can even find a place in other Paladin deck types--like for example, the long-awaited Spectral Duke Dragon. As the successor to Phantom Blaster Dragon, Spectral has a certain reputation to live up to. And immediately, he's on the right track; at limit break 4, for a counterblast 2 and retire 3, he can stand himself at the price of twin drive. This does not rely on his attack hitting. As such, if the opponent drops a perfect guard on the attack, it's entirely possible to pull off Spectral's limit break and try again. This ability can be repeated on your following turn, and even the turn after that if you get a heal trigger, making it a devastating maneuver for any opponent to face. Furthermore, it allows for three trigger checks in all. Spectral's autoskill gives him +1000 power during either player's turn when he has the Gold's Blaster Dark equivalent, Knight of the Dark Dragon, Vortimer in his soul. This puts added pressure on the opponent's hand and helps force his attacks through. Spectral Duke Dragon easily measures up to Eisele. Gold Paladin cardfighters have the freedom to choose either unit as their winning image, and Garmore can be brought in as an alternative vanguard for both lines.